What Do These Actors and Actresses Have in Common? These are famous actors and actresses of the silver and small screen. What do they all have in common? Jean Simmons: scouted in 1945 in London, presumably after World War II, Simmons moved to Hollywood and began an acting career that made her one of the most famous faces in the world, starring in such films as The Actress, Guys and Dolls, The Big Country, and Spartacus. Grace Kelly: an acting icon, Kelly became America’s modern-day princess when she famously married Prince Ranier of Monaco, after starring in such films as High Noon, Dial M for Murder, Rear Window, To Catch a Thief and High Society. Swoosie Kurtz: Emmy Award winner and two-time Tony Award winner from Omaha, Nebraska, who is better known on American television programs Carol and Company, Sisters, and Mike and Molly. Hugh Laurie, an Oxford, England native who rose to fame as a comedy duo called Fry and Laurie, with Stephen Fry, and became a household name in America in the hit drama series, House, M.D. Charlotte Rampling, British siren who starred in such films as Georgy Girl, The Damned, The Night Porter, Stardust Memories and The Verdict. She was recently in the news for her controversial comments regarding Blacks and acting. The answer is….their fathers were all successful Olympians! Charles Simmons: was part of the British bronze-medal winning gymnastics team in the 1912 Olympics in Stockholm Sweden, and father of femme fatale, Jean Simmons. John Kelly: 3-time gold medalist, two at the 1920 Antwerp Games in single scull and double sculls (rowing), and a gold in double sculls at the 1924 Paris Games, who was father of Princess Grace. 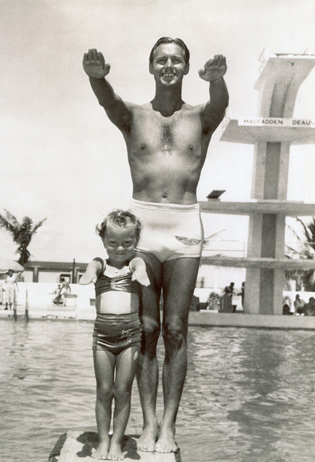 Frank Kurtz: a bronze medalist in the 1932 Los Angeles Games in the 10-meter platform dive, Kurtz was the father of Swoosie. Ran Laurie: Like John Kelly, Ran Laurie was a rower who took gold in the coxless pairs at the 1948 London Games, whose partner on that gold-medal winning team was Jack Wilson. As mentioned above, Hugh Laurie starred in hit series, House, and coincidentally, the name of Gregory House’s best friend in the TV series House was James Wilson. Godfrey Rampling: on the 4×400 relay team for Great Britain, Rampling won silver at the 1932 Los Angeles Games, and gold at the 1936 Berlin Games, before fathering Charlotte 10 years later. Posted in Boating Sports, Other Olympics, Pop Culture, Track and FIeld, Water Sports and tagged 1912 Stockholm Olympics, 1920 Antwerp Olympics, 1924 Paris Olympics, 1936 Berlin Olympics, 1948 London Olympics, actors, actresses, Charles Simmons, Charlotte Rampling, Dial M for Murder, fathers, Frank Kurtz, Georgy Girl, Godfrey Rampling, Grace Kelly, High Noon, House MD, Hugh Laurie, Jean Simmons, John B. Kelly, Ran Laurie, Spartacus, Swoosie Kurtz. Bookmark the permalink.